Videos | Could Joseph and Imhotep have been the same person? ‘If Joseph and Imhotep were the same person’……Djoser would have died in the 4-5th year of the famine. Joseph would have been responsible for embalming and burying Djoser and constructing his Mastaba. If Joseph and Imhotep were the same person, what we know about Joseph from the Bible can be combined with what we know about Imhotep from Egyptian historical records to build up a more complete picture of Joseph / Imhotep and his dealings with the Pharaoh in Egypt. Of course, there would have to be considerable overlap between the Biblical and the Egyptian accounts otherwise one would have to question whether or not they were the same person. Information omitted in one source can be can be recovered from the other source if indeed they were the same person. Allowance needs to be made for the reliability and accuracy of the historical documents. The Famine Stella tells us that Joseph (if he was Imhotep) came to Djoser in the 18th year of his reign. Manetho tells us that Djoser reigned for 29 years. Djoser would, therefore, have died in the 4th or 5th year of the famine when Joseph / Imhotep was his vizier. Joseph / Imhotep would have been responsible for embalming the pharaoh and would have had to bury Djoser after his death and construct his mastaba. If Joseph and Imhotep were the same person, Joseph would have been appointed as the vizier to Djoser (second in charge of Egypt) in the 18th year of Djoser. In his first seven years, Joseph would have concentrated on building grain silos in key Egyptian cities to store the grain. Joseph also constructed canals which turned the desert into a fertile oasis (although legend says it was in the later part of his life and it is not clear which pharaoh he served). The ‘Canal of Joseph’, as it is known, irrigates the area known as the Faiyum which is like an oasis in the middle of Egypt quite close to Saqqara where the 3rd dynasty of Djoser was centered. Deep square pits cut into the bedrock can be found in several key Egyptian cities. 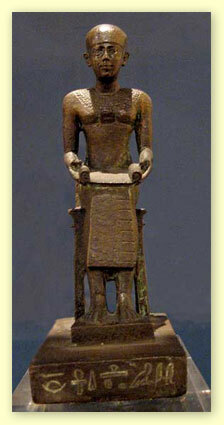 Joseph / Imhotep imposed a 20% tax on the grain produced in Egypt. The grain was poured into the these pits (silos) for storage so it could be used in times of famine. A tunnel system allowed access to the bottom of the pits in order to retrieve the grain that had been stored the longest. Joseph / Imhotep developed a progressively more and more elaborate system of pits and tunnels to store and retrieve the grain. The first grain silo that Joseph constructed at Saqqara was enormous. It was big enough to hold enough grain to cater for the needs of the surrounding cities and more for many years. A complex maze of tunnels allowed access to the bottom of the silo from four different directions underground but there was only one main entrance which was quite steep and ventilation would have been poor. Newer silos constructed by Imhotep / Joseph were even more elaborate. At Saqqara, within the Step Pyramid complex, a series of eleven pits can be found in a row. These pits all drain in to a common pit which is accessible via stairs in an adjacent pit. Grain was poured into the top of these pits and drained into a common pit. The grain from all of the pits could be retrieved via tunnels that could be entered from a single pit within the Step Pyramid complex. No wonder people would worship the God of Joseph / Imhotep. Servants would disappear down some stairs in the Step Pyramid Complex and emerge with a seemingly endless supply of corn while the rest of the world was starving! Interestingly, the columns of the building at the entrance to the Step Pyramid had the shape of a giant cob of corn . The original pit that Joseph built to store grain in became redundant and was superseded. When Djoser died unexpectedly in the 11th year of Joseph / Imhotep’s service, it was Joseph / Imhotep who was responsible for embalming the Pharaoh and building his tomb. What better place to bury Djoser than in the bottom of the first grain silo that he had used to save Egypt from famine. The burial chamber of Djoser is a huge shaft that is situated under the Step Pyramid. The shaft has the same dimensions as the grain silos in other parts of the complex. It had a complex series of tunnels connecting to the bottom of the shaft at four points (North South East and West). If the tunnels were used to deter grave robbers, they would not have achieved their purpose as they all lead to the burial chamber. There was one common entrance which divided into four sections of underground tunnels that all lead to the burial chamber. The tunnels were narrow and steep and ventilation would have been poor. 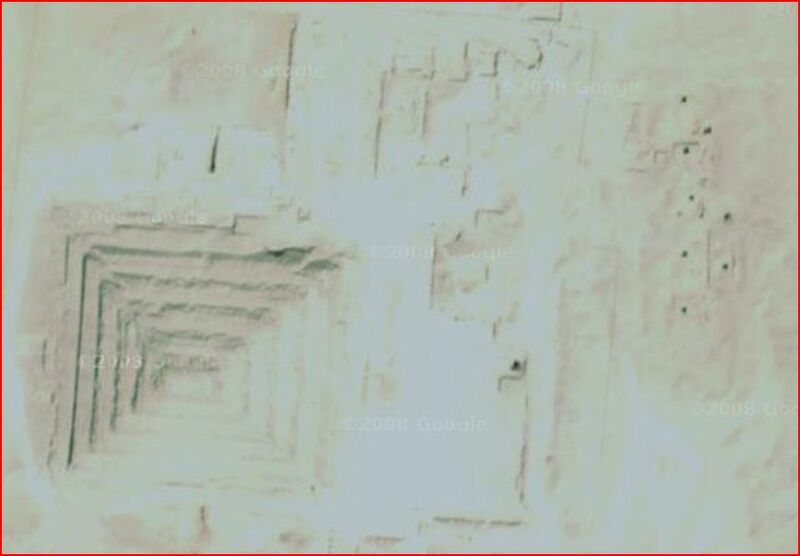 They were no doubt created to allow access to the bottom of the central pit under the Step Pyramid. When Pharaoh Djoser died unexpectedly, Imhotep (Joseph) needed a place to bury the pharaoh and decided to bury him in the first grain silo that had enabled Imhotep to save the Egyptians from famine, making the Pharaoh rich and enabling him to acquire all the land of Egypt except that of the Priests. When it was time to bury Djoser, the silo was lined (or cased) with beautifully adorned limestone blocks. Large slabs of granite were lowered into the silo to construct a sarcophagus for Djoser, into which, the coffin and mummy of Djoser was placed. A massive slab of granite was used to seal the top of the central pit. Joseph / Imhotep then constructed a mastaba on top of the burial chamber. The mastaba of Djoser was the first to be constructed out of solid limestone blocks. Prior to Djoser, mastabas were made out of mud bricks. As subsequent members of Djoser’s family died, the limestone masaba was extended, first horizontally and then upwards with successive mastabas stacked on top of one another. The result was the Step Pyramid (The first pyramid to be built in Egypt). The largest building of it’s time. Made out of solid limestone blocks and finally faced with nicely cut limestone. As a result of erosion, pilfering and earthquakes, the outer facing has largely fallen away over the centuries revealing the inner core of mastabas stacked on top of one another to bury Djoser himself in the central shaft beneath the pyramid, and his three wives and 11 daughters in the multiple extensions of the original mastaba above Djoser’s burial chamber. In approximately 500BC, the limestone casing lining the central shaft under the pyramid caved in crushing the Sarcophagus of Djoser at the bottom of the shaft. It was only in recent years that the rubble could be removed without damaging the tomb or causing it to cave in. Unfortunately, when the sarcophagus was opened, all that remained of pharaoh Djoser’s mummy was one of his feet. Grave robbers had been there first. The tunnels that lead to the bottom of the burial chamber went right under Djoser’s sarcophagus. These tunnels, rather than deter grave robbers, lead them straight to Djoser’s sarcophagus. If Joseph and Imhotep were the same person, Joseph would have constructed the Step Pyramid to bury Djoser and his family after the famine. The burial chamber of Djoser would have been used as a grain storage silo first and then converted to a burial chamber for Djoser on top of which the Step Pyramid was constructed in stages to bury the rest of Djoser’s family!